Browsing through your posts has never been easier. Posts app displays your latest posts neatly organized by date and the built-in calendar lets you quickly jump to a different day. For the ultimate global view, you can even choose to see the posts from all your blogs displayed simultaneously alongside one another. In today’s world, our devices are connected to the internet almost 24/7. However, there are always those occasions when internet access is simply not available. We don’t want to let this stop you from working on your blog. Posts app can work offline in several ways. 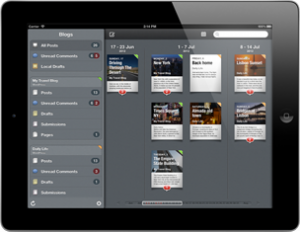 The “Outbox” lets you see all the changes that will be pushed to your blogs once internet connectivity is restored. Editing: new posts and pages can be created, and existing posts and pages can be edited. If you choose to publish or update them when you’re done, they’ll be put in the “Outbox”. Comments: you can create new comments or reply to existing ones. Some moderation tasks can also be performed while working offline. 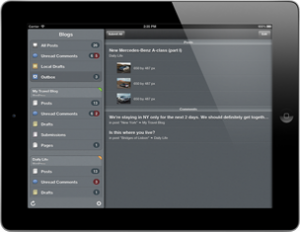 Offline storage: a copy of the posts, pages and comments that Posts app displays is stored locally on your iPad. If you know you are going to be offline for a while, you can let Posts app sync with your blogs before going offline to get all the new stuff. Then, you’ll be able to read and moderate any new comments even when you’re not connected. Getting up-to-date with the comments written on your posts will be a breeze. Posts app can keep track of the comments that you have already read and processed, and show you only those that are new. This will allow you to read and approve them (or reject them) in no time.